The World Figure Skating Championship is a prestigious tournament that is held annually in the month of March. The Participants are awarded medals in four categories, which include the men’s singles, ladies singles, ice dancing and pair skating. The history of the events dates back to the late 19th century. The first championship was held in 1896 in Saint Petersburg. It was known as the Championship of the Internationale Eislauf-Vereingung. The first ladies competition was held in Davos in 1906, while in 1908, the first pair competition was held in St. Petersburg. In 1952, ice dancing was also officially included in the championships. Till date, the United States has been the most successful nation winning a total of 191 medals in all the four categories. Germany has won a total of 120 medals. Of this, East and West Germany, which existed from 1949 to 1990, won 40 and 25 medals respectively, while unified Germany won 55 medals. Austria has till date bagged 116 medals. Meanwhile, the former Soviet Union, which was in existence from 1922 to 1991, won 110 medals. Canada is another nation, which has won more than 100 medals. Canada’s tally till date stands at 105. Great Britain and Russia have won 82 and 79 medals respectively, while France’s tally stands at 49. 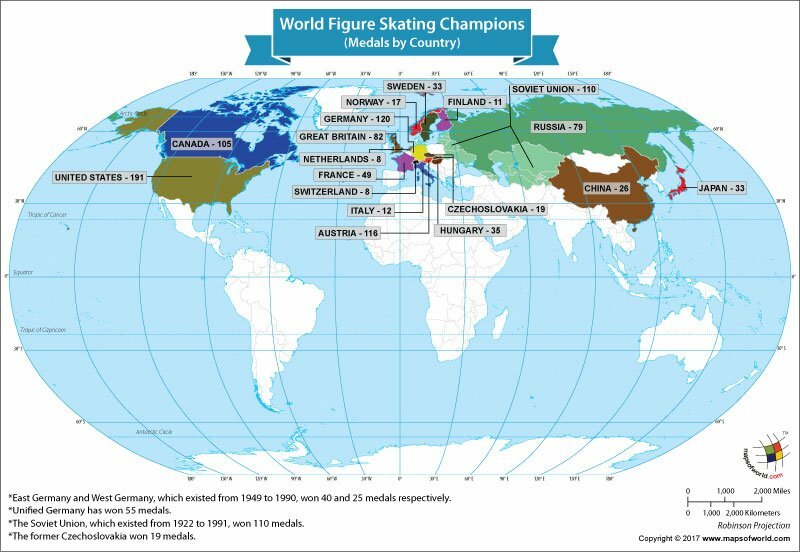 Other nations that won medals at the World Figure Skating Championship are Hungary, Sweden, Japan, China, Norway, Italy, Finland, Switzerland, the Netherlands, and the former nation of Czechoslovakia. The table below provides information on the number of medals won by each nation at the World Figure Skating Championships.